“5G? What will this be?” Maya wondered at once. With a curious mind, the answer she set out to find. Through the town, over the stream, and into the forest Maya skipped. â&#x20AC;&#x153;What impact will it have on our future?â&#x20AC;? She pondered during her trip. She arrived at an old cottage, quaint and so fair. A dear old wizard and his family lived there. Maya looked at the wizard and politely asked, â&#x20AC;&#x153;But, what does that mean for me? And my smart TV?â&#x20AC;? â&#x20AC;&#x153;Those shows you stream and the VR games you play, will get better, and smarter and faster someday. From AI to VR to AR and robotics, 5G will make our lives with tech more symbiotic.â&#x20AC;? â&#x20AC;&#x153;Can I interest you in a data plan?â&#x20AC;? The wizard then asked, and Maya walked out. Her need for more info was oh so steadfast. The smallest of dwarves spoke up with such joy, â&#x20AC;&#x153;5G will start as a carrier ploy. Wireless services will be first to adopt, boasting quick speeds so their plans you will shop!â&#x20AC;? â&#x20AC;&#x153;From this moment on through 2020, 5G will certainly pop up in your city.â&#x20AC;? â&#x20AC;&#x153;See, lag times and slowness from too many users overpowers broadband and bogs down your computers. 5G will provide a wider spectrum of broadband connection, allowing more people more downloads, with a commercial intention.â&#x20AC;? â&#x20AC;&#x153;Beyond cell phones and carriers, 5G has more meaning, it will give self-driving cars more chances at being. Cars will be able to connect with each other, learning more about collisions, conditions and life saving additions.â&#x20AC;? â&#x20AC;&#x153;5G also means more for your select cities, giving public works offices great opportunities.â&#x20AC;? Maya was so shocked by this harrowing news, her options of 5G had her bemused. She ran through the woods, over the river and flew back into town, up to her house, and into her bedroom safe and sound. She sat and she pondered about all she had heard. Some was exciting, but some simply absurd. A battle with China china, unknown health risks and price, for AI, a wider spectrum of broadband, and driverless cars to come more to life. â&#x20AC;&#x153;Some parts are quite scary, and of those I am wary. But, 5G is coming, and sure coming fast. This new tech revolution could be such a blast.â&#x20AC;? It could make our lives better, we’ll know much more in awhile. Until then, Maya decided to put down her phone and play outside… …with a smile. Oh My, Oh Me, Here Comes 5G! 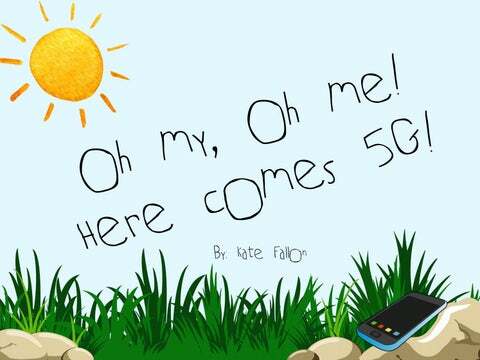 A short children's story about 5G technology.